The Kodak Point-of-Care CR 120 System is ideal for a wide range of computed radiography examinations in specialty practices such as chiropractors, podiatrists, and orthopaedists. It is also well suited for small clinics, mobile units, and offshore locations including oil rigs and cruise ships. This system enables all imaging functions to be performed at the point of patient care with one compact, affordable package that includes the single-plate CR reader, Ko da k flexible phosphor screens, advanced image management software, and a PC-based review station. Perfect for environments where small size, simplicity of use, and performance are critical, the CR 120 System also provides low-volume environments with an excellent entry to digital imaging. The Ko da k Point-of-Care CR 120 System can be configured for most clinical applications. A simple-to-use Ko da k Quality Control Scanner interface designed for full DICOM connectivity allows you to set up the system to capture highquality x-ray images of any body part. All imaging parameters are optimized, resulting in digital images that can be enhanced, enlarged, duplicated, and sent to any location in seconds with no loss of resolution. Images can be printed or archived locally on CDs or DVDs. Mounted on an optional wheeled Z-cart or placed on a tabletop, the Ko da k Point-of-Care CR 120 System can be used in virtually any location. With the Z-cart, this system can be rolled into any situation where nearly instant digital images are needed. 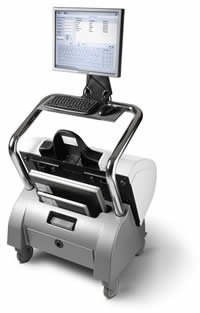 The Point-of-Care CR 120 System can provide a complete mobile digital imaging solution on wheels. Mount the system in a van or truck and combine it with reusable Ko da k flexible phosphor screens and cassettes, a rugged laptop computer, and portable x-ray equipment. Then drive anywhere x-ray exams are needed. Ko da k Point-of-Care mobile solutions serve nursing facilities, prisons, forensic institutions, employee screening needs, and more throughout the world.